I know, I know...I get it. 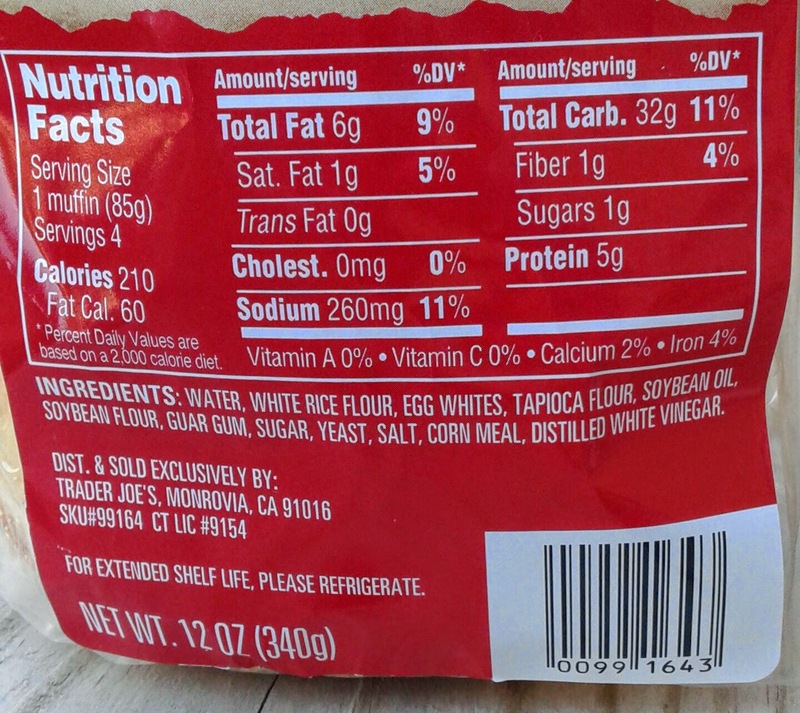 There's a case to be made that I shouldn't review gluten-free products, seeing as that I have no gluten sensitivities whatsoever, and haven't tried brands and offerings to really fairly stack Trader Joe's offerings against. See my low score for their GF rice mac 'n cheese - I got a lot of flak from the celiac/sympathizer crowd for that. But, the thing is, even for their relatively small amount of product offering, market a lot of gluten free products, most of them for a good price, and somebody has to review them, right? Why not me? I'm a complete amateur-hack foodie blogger for the best darn TJ's site on the Interwebz, so if I can't, no one can, and perhaps there's only lonely celiac-sufferer out there, wondering to know where they can get something like an English muffin, and doggone it, if this review helps them, it's worth it. 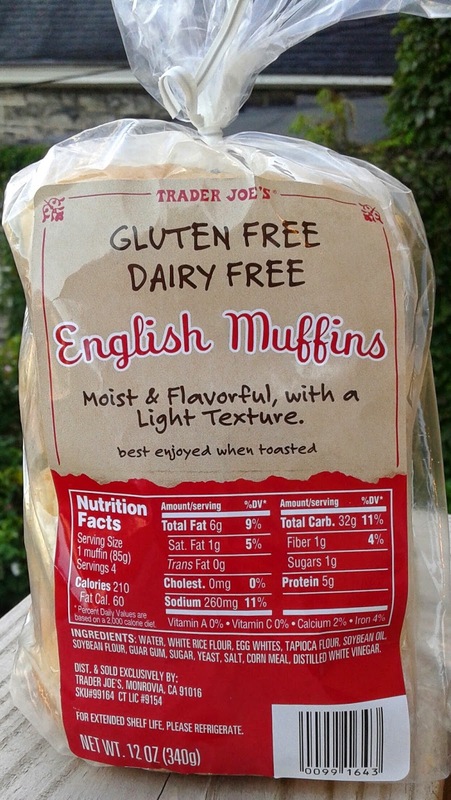 The obvious comparison for Trader Joe's Gluten Free Dairy Free English Muffins is those famous Thomas fellows that all of us grew up on poking apart with our forks, making a mess on the floor much to our dog's delight and mother's chagrin. That's the only other English muffin out there I can rank TJ's against...and it's not close. They're almost completely different, just happening to share the same name, like this poor guy. First, the TJ ones are much larger than their Thomas counterparts - at least twice, maybe closer to three times larger. That's an absurd size. Second, there's no forksplitting the TJ's, at least not easily - HELLO THAT"S HALF THE FUN GONE RIGHT THERE. There's no nooks and crannies or even crooks and nannies once cut - it's just silly, kinda sad looking bread circle. And for texture, they feel like lovechild offspring from a biscuit and a piece of cornbread - even after toasting, it's a pretty crumbly mess. "Light texture" it says on the bag - riiiight. I mean, the taste seems about right, but that's about it. Sandy and I made some breakfast sandwiches one evening for dinner using these, and by halfway through, I kinda regretted it. There was just too much bread and it wasn't that good - I felt like all I was eating was bread and not eggs and sausage too. Even Sandy agreed on that front. She tried one again a day or two later, this time just toasted with some butter and jam, and said it tasted and felt a little better going down, although both she and I rule out the notion of making English muffin pizzas with these - we both doubt the muffin would hold up. There's one of these left currently, and I'm thinking that chances are good it'll end up as duck food at the local creek this weekend. I've been trying to avoid carbs anyways for the most part, so for me, this is not a worthy indulgence. Sandy was slightly more in favor of them than I, giving them a three while noting their inherent dryness. I counter with a two. Perhaps for some, this is a viable alternative (if so, leave a comment so we know! ), but if there's no need to have a gluten free diet, there's no need to pick up these up. Could you do a post on key lime pie please? Thank you! hope this doesn't crowd out my favorite fat-free english muffins which are often low in stock at my TJ. Had Gluten free waffles years ago and it was the worst thing I've ever had. You just can't compare gluten-free anything to it's glutinous counterpart. It's just not fair. GF foods that are trying to fill the void for glutards everywhere have their own merit. I enjoyed these English Muffins but I know they are only half as good as the real deal. But they do hold up to a breakfast sandwich and taste pretty good with butter and jam. If you are glutard, these are worthwhile to have in your freezer for when the GF bagels run out. THe TJ GF bagels are also the best GF bagels I have ever had.